La Ferronnerie vous accueille dans un cadre chaleureux et convivial. Vous y trouverez une ambiance paisible et un personnel souriant. Venez découvrir des plats variés soigneusement préparés par le chef. Du 4 au 24 août 2014 inclus. The welcome was warm and service quick. The lamb was served cold, in slices, with mustard. I expected warm lamb with sauce. The green beans were also cold, but tasty. Mashed potatoes were warm and very good. I was the only customer at 8 pm on a Sat. night. Not at all what I expected for 38 euros. Tiny with a single waitress but both service and food were excellent. The wine list isn't fancy but it is excellent and flexible. They did not acknowledge our Fork reservation but seated us anyway. We look forward to returning for dinner on our next trip. We returned to La Ferronnerie after a terrific dinner there last year. 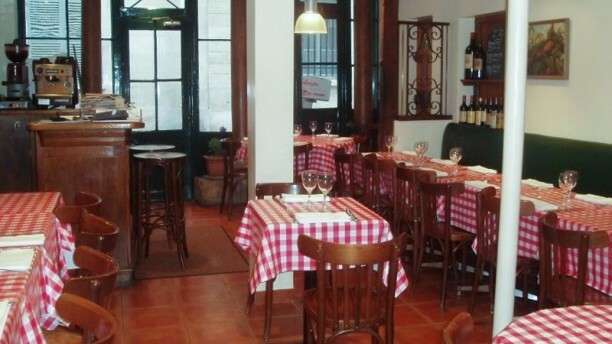 We find it a welcoming unpretentious, small bistro with high quality simple French food. Charming neighborhood restaurant! Owner spoke English and took excellent care of us. He translated entire menu for us, so sweet. Small neighborhood cafe with very little English spoken. Good service and great food. No tourists! I would definitely return. A small and welcoming neighbourhood restaurant on a quiet street offering fairly classic dishes that are well prepared. We enjoyed the food and the service provided by the owner. He was kind to us. As we spoke no French, he translated the entire blackboard. Those who were dining were from the neighborhood. Arrived for a Sunday evening res. Nice window table. Blackboard specials suggested by waiter, I took suggestion for oyster shrimp risotto and was not disappointed! Excellent little gem of a place..wonderful down home french cooking. Cozy and lovely atmosphere. Great service..will definately be back. Tres bien. Great service, food and ambiance.